Fortis has been in the space watches game since the 1960’s when the space programs were in their infancy, so you know Fortis has a special expertise in these type of watches. Created back in the 60’s, the Spacematic models are different in their form and function—they would have to be in order to take the beating of the unusual zero gravity environment. They are produced for legibility, robustness and easy handling. How good are the Fortis space watches? Well, consider that Star City Training Center, a Russian training center for cosmonauts chose the Fortis watch, later renamed the Official Cosmonauts Chronograph, as part of their official equipment. The watch was put through its paces in and out of the spacecraft. From the collaboration between the Russians and Fortis, the Official Cosmonauts watch was crafted with an Automatic Alarm, making it the world’s first automatic chrono with a mechanical alarm. The Russians trust the Fortis space watches and still use them on their missions. The Spacematic watches have an unusual design that makes them stand out from other watches in their class. The Classic White-Red has a white face with red hands, which gives it its name. This is a day/date watch but it has an execution that is entirely original. Both the day and date discs are exposed and have a vintage look because they are inspired from a vintage Fortis. They align at three o’clock for easy viewing. 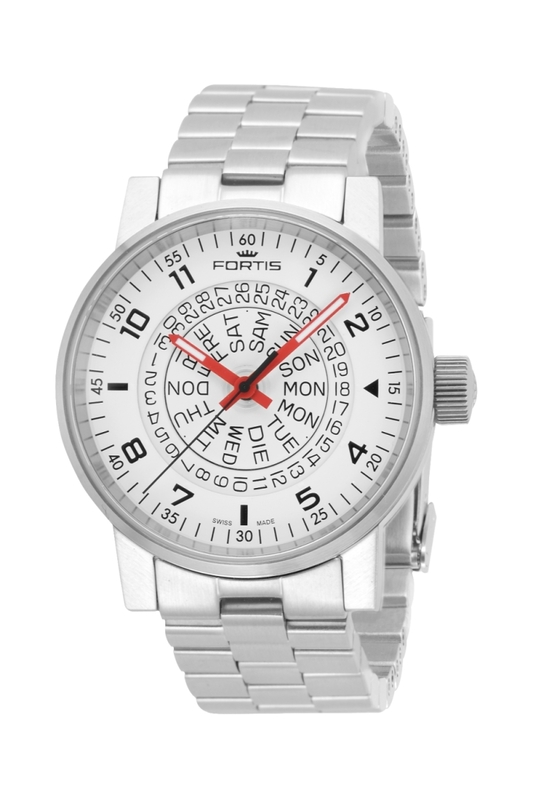 In addition, the Spacematic Classic Red-White has a bilingual date disc in both German and English. The Arabic hours and hands, coated in SuperLuminova that gives it a sharp blue glow, and the minute track give timing to the minute. The 40 mm stainless steel case with a stainless bracelet and fold-over clasp features brush and matte finishes and a large knurled crown for easy gripping and adjustment with the Fortis logo embossed on it. The screw down case with a sapphire back is water resistant to 330 feet. Fortis chose a Swiss made ETA 2836-2 automatic movement to drive the mechanics for its robust reliability. Especially in space, accurate timing is a must. An extra and practical function Fortis included was a centre-stop second, which means when the crown is pulled out the seconds hand stops. In this way, the watch can be set to the second for spot-on accuracy. For an original watch comfortable with or without zero gravitational pull, the Fortis Spacematic Classic White-Red is a winner for all occasions.